John William CHADWICK Jr. [scrapbook] 1, 2-10849 was born 3 on 21 Apr 1922 in North Ogden, Weber, Utah, United States. He was christened on 4 Jun 1922 in North Ogden, Weber, Utah, United States. He died 4 on 23 Jul 2007 in Salt Lake City, Salt Lake, Utah, United States. He was buried on 27 Jul 2007 in Ben Lomond Cemetery, North Ogden, Weber, Utah, United States. 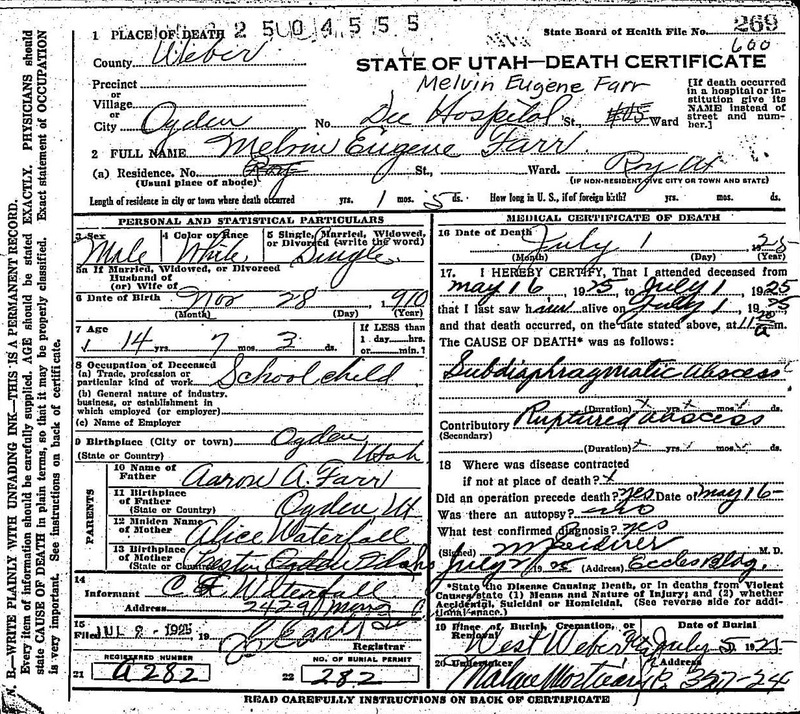 John married (MRIN:4691) Nelda FARR-10848 on 3 Jul 1946 in Oakland, Alameda, California, United States. John William Chadwick passed away July 23, 2007 at the VA Hospital in Salt Lake City, Utah after a short illness. He was born April 21, 1922 the son of John L. and Pearl Woodland Chadwick in North Ogden, Utah. He married Nelda Farr in 1946 in Oakland, California. Their marriage was later solemnized in the Salt Lake LDS Temple. John graduated from Weber County High School in 1940, and attended Weber College but was interrupted by WWII. He served in the US Coast Guard – Pacific Theater for four years. He graduated from the University of Utah with a degree in accounting in 1950. John served in various LDS church assignments. His civic duties included: President and Lt Governor of Optimist Club of Utah and Western area; Member of Murray Rotary International, and was awarded the Paul Harris Fellowship by the members; lifetime board member of Murray Boys and Girls Club; President of Utah Society of Public Accountants; member of the state Board of Accounting and was instrumental in the writing and passage of licensing and regulatory statutes for accountants. He was a pioneer in computerizing accounting procedures. For 20 years, John organized genealogy and established computer records. He was Beta Tester for the LDS Church software that is now in use. John was a life long western history buff. John is survived by his wife of 61 years, Nelda, children René, John Larry, and David Farr; nine grandchildren and eleven great grandchildren. Funeral services will be held 11 am Friday, July 27, 2007 at Lindquist's Bountiful Mortuary, 727 N. 400 E. where friends may call 9:45-10:45 am prior to services. Interment Ben Lomond Cemetery, North Ogden, Utah. In lieu of flowers the family suggests donations may be made to Murray Boys and Girls Club, U of U College of Nursing or a charity of your choice. M i Joshua Lindahl FARR-10867. F ii Ashlee Larene FARR-10868. M iii Jaxson Lloyd FARR-10869. F i Madeline Sophia FARR-11502. M i Tyson Kenneth FARR-10860. M ii Braden Dallas FARR-10861. M iii Nathan Michael FARR-11503. M iv Justin Lewis FARR-11504. F v Jessica Nalani FARR-11505. M i Logan Thomas FARR-10864. F ii Megan Nicole FARR-10865. F iv Reegan Olivia FARR-11508.